Busy Busy Busy, Just the Way I Like It! WHEW! That’s about the only word I can use to describe this past week. A four day get away, a busy studio, and some new finds that I just love and maybe a surprise too. My work in progress board might seem short, but for only being in the studio 3 of the past 7 days, I got a lot done. 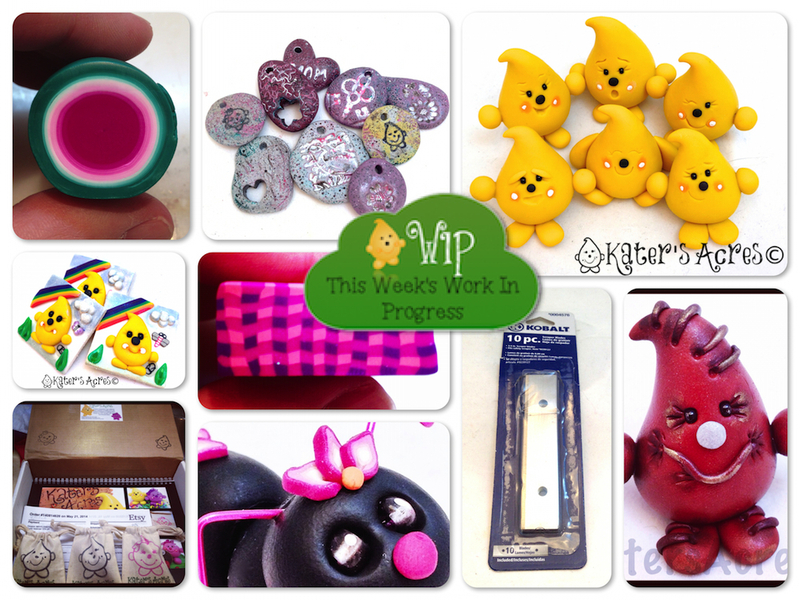 Catch up with me (clockwise from top left) and my week and don’t forget to share what’s going on in yours. Another Skinner Blend, almost an exact duplicate of a blend I did before … why? Because I can’t help it, I just love fuchsia, emerald, and white. Here’s a few pretty cool “Ancient Artifact” pendants that I made using the tutorial I posted yesterday. This tutorial is super easy, super quick, & with minimal supplies. Emoticon Parker Series! I fell in love with these and in love making these. All 6 figurines have now been adopted, but don’t worry because the next 6 are coming the first part of June. Faux Leather Parker has been released in my Etsy Store for adoption. These are a limited edition of 2, so be sure to adopt them while they are still there. Total Parker’s made this week: 15 … Yep, it’s a Parker-o-rific week! A new polymer clay blade option. WOO HOO! I go through blades for my polymer clay pretty quickly and let’s face it, they are kind of expensive. I bought a 10 pack of Kobalt blades I got at the hardware store for under $5.00 … that’s $0.50 a piece. And WOW are they sharp and the perfect size at about 4 inches long. What’s that cute black character? That’s the NEW figurine that will be released for Parker’s Clayful Tutorial Club Members on Monday! Be sure to join the club now so you don’t miss out. Just one of many orders & shipments this week. This order included my last & final calendar. Next year’s calendars will be through pre-order only. Here’s the Gingham Cane I made for the 52 Weeks of Canes. There was only one problem … my studio was 85 degrees and I didn’t let my cane rest … and I know better. But, alas, distortion central! But, since I was using it to make a tablecloth, it will still work. Last but not least, I made some collectible Parker inchies that are available in my Etsy store. My hubby & I took a nice long weekend away … away from work, the computer, & life in general. It was our first real getaway in over a year and a half. We visited Pittsburgh and had a great time. Did you know it’s possible to be scared by a dinosaur? Well … it is. Check out the picture on the right of my hubby & I being scared by the dinosaur … bones. HA! In making the figurine for an upcoming tutorial, we lost power & my oven spiked … my figurine cracked. I had to start all over … that was very frustrating. ARG! I really want to see the new Maleficent movie … have you seen it? Is it any good?